Indology : Past, Present and Future is a compilation of seminar papers in which scholars of India as well as abroad have discussed at length the state of Indology in the past, present and future. Indology which has a history of a little over two hundred years, started and nurtured in the west. It arrived in India along with a few other imported ideologies with the package of modern higher education during the pre-independence period. Since then, a new current of indigenous Indology joined the main current. With the explosion of knowledge, however, Indology is experiencing a low ebb both in the West as well as in India. Science and technology being the areas of priority in a developing nation like India, Indology and other humanities are bound to have been scaled down in the curricula on different levels. Indology will, as any other discipline, take cognizance of the changing face of the world and to adapt itself to the prevailing situation. Some papers of the volume dealt with the fundamental theme of Indology and some devoted to the status reports on Indology in different countries such as USA, Brazil, Russia, Poland, China and Australia. The topics selected for the seminar offered a wide range of problems based on Indology, which is not embracing all aspects of Indian culture. This collection will enable researchers of India and West to work together rather than against each other. 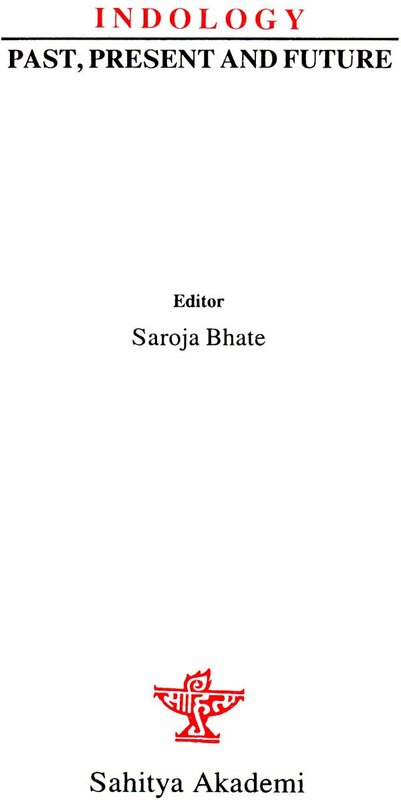 Saroja V. Bhate born on 5.1.1942 in Satara District of Maharashtra. She got her Ph.D. from Poona University. She has published 10 books, number of research papers and visited many countries. At present she is Professor and Head of the Department of Sanskrit and Prakrit Languages, Poona University, Pune. Indology is a branch of a wider discipline called Orientology which is a western invention. It is the result of the romanticist impulse of the 19th century West. The western acquaintance with India with its rich heritage going far back in antiquity inspired interest in India's culture enchrined in its classical literature as well as in art and architecturel. With the growing interest in the living traditions in this part of the world the western scholarship engaged itself in fathoming the cultural wealth of the Indian subcontinent. Needless to say that 'India' from which 'Indology' is derived represents the Indian subcontinent. Started and nurtured in the West, Indology has a history of a little over 200 years. It arrived in India along with a few other imported ideologies with the package of modern higher education during pre-independence period. Since then a new current of indigenous Indology joined the main current. The contact with the Western Indologists led to India's self-understanding and Indology got firmly rooted in the soil of its motherland. Eminent Indian Indologists contributed a great deal to the establishment and development of this new discipline. Indology thus flourished under the leadership of erudite scholars, both, Western and Indian, in diverse directions including philological, literary, religious, philosophical and socio-cultural studies. It has also entered the computer age alongwith other branches of knowledge and has occupied a website for itself. With the explosion knowledge however, Indology is experiencing a low ebb both in the West as well as in India. Science and technology being the areas of priority in a developing nation like India, Indology and other humanities are bound to have been scaled down in the curricula on different levels. The general apathy in the Indian mind towards Indology is mainly due to its less job potential as well as a strong impact of westernizaton. Therefore those who pursue the study of Indology in the present situation do so either because they are committed to the perpetution of the tradition of their nation or because they have no better choice. As a result, the considerably low standard of the research output, lack of motivation, adherence to outdated research methodologies and absence of insight into genuine problems in different areas of Indology are characteristic of post -independence predicament. A traveller on this path of Indology who is seriously concerned with the future of this discipline has to address himself to the questions such as, Can Indology service this predicament? Can it face the challenge of the 21st Century? Does it have a future? The reply to these questions is 'Yes', however, with a proviso. 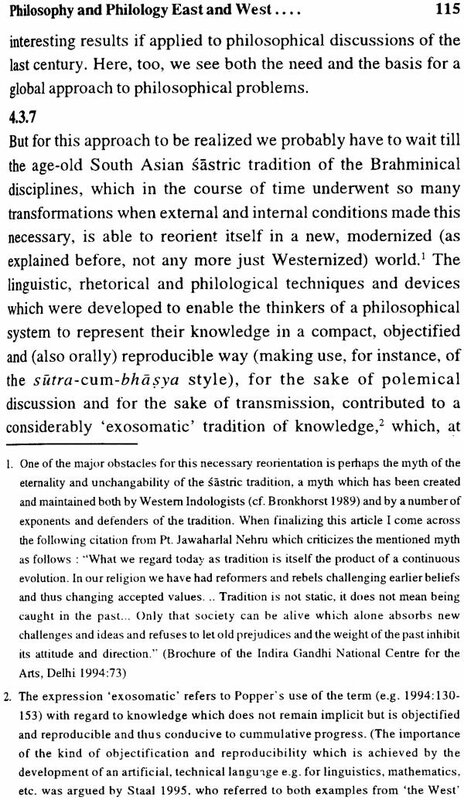 First of all, Indology has, as any other discipline, to take cognizance of the changing face of the world and to adapt itself to the existing situation. A few hints may be offered here for the prospective Indologists who would wish to make Indology viable for the coming century. 1. Inter-disciplinary as well as multi-disciplinary approaches should replace the outdated methodology consisting of a mere philosophical approach. While on the one hand a good grounding in the grammar of at least one of the classical languages is a must for every student of Indology, on the other, he is expected to closely study recent contributions in sociological and anthropological theories and to find out whether they can offer any model(s) applicable to the area of his study. His observation based on linguistic data should, for instance, be supported by archaeological and other kind of evidence. 2. The development of Information Technology with a formidable speed has been a matter of both, excitement and anxiety for an academician. He has to be on his alert while receiving knowledge and information from every comer of the world and, at the same time, save his own contribution from being outdated the moment it is made. Computers, Internet, WWW, network programmes and similar other educational aids have become an indispensable tool for higher studies. A student of Indology cannot afford to shun away from exposure to these modem tools of research. Reference is already made to the special site called Indology on Internet which every student of Indology must visit and enrich by his own contributions. It should be further borne in mind that computers have brought in revolution not only by minimizing hard manual labour and time span required for higher studies but also by opening new approaches to the tradition, linguistic and philological problems. 3. The most disappointing feature of the current higher studies in Indian Indology is that in most of the cases scholars are engaged in finding a reply to the question 'What'? whereas very few studies have addressed the question 'Why'? In fact after its progress for the last two centuries much more of What-Indo logy is exhausted, whereas there is lot of scope for Why-Indology. 'Why?' is indeed, central to all research. A scholar writing on Paninian theory of grammar should, for instance, try to seek a reply to the question, why certain letters are not accepted by Panini in his system of anubandhas rather than merely listing the anubandha letters. 4. Repetition of certain topics is another glaring feature of current Indological research. While on the one hand, great poets like Kalidasa and great epics like Ramayana are repeatedly subjected to studies, on the other, more challenging areas such as inscriptions and Tibetan sources of Sanskrit literature are neglected. Time has come for the senior Indologists to awaken their students to the emerging areas of research including new dimensions added by computer technology. Students and researchers in Sanskrit have to be aware of the fact that Sanskrit is not merely a cultural language of India but it was "found as the paramount linguistic medium by which ruling elites expressed their power from Purusapura (Peshawar) in Gandhara in the northwest of the subcontinent to as far east as Panduranga in Annam (South Vietnam) and Prambanan in Central Java" (Sheldon Pollock, the Sanskrit Cosmopolis, 300-1300: Transculturation, Vernacularization, and question of Identity', Indology and status of Sanskrit, ed. Jan E.M. Houben, E.J. Leiden, 1996, p. 198).